You are at:Home»BUZZ»SwitchCharge – the battery case for the Nintendo Switch! SwitchCharge, a battery case for the Nintendo Switch solves a couple of issues we have with the Nintendo Switch: battery life and the flimsy kickstand. The battery on the Nintendo Switch lasts roughly 3 hours on the go – while this is great, on longer road trips, overseas flights or when you forget to bring a charger – 3 hours might not be enough. 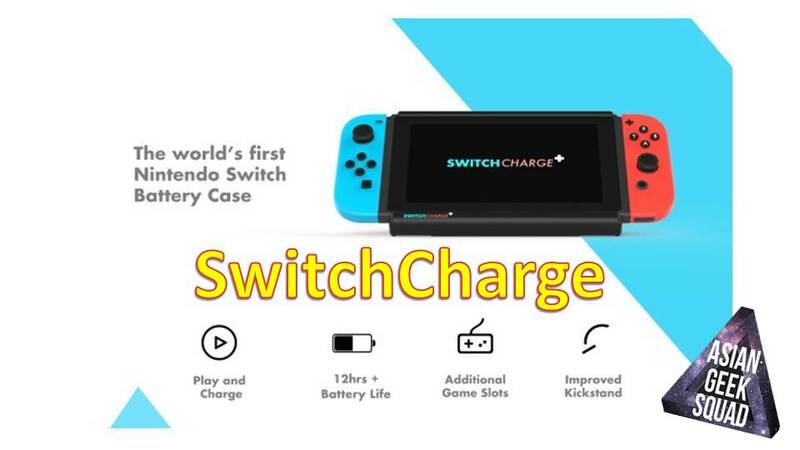 Here is where SwitchCharge comes in, currently priced at $85 ($75 early birds have sold out), the battery case snaps on to your Nintendo Switch and provides an additional 12,000mAh battery, which will extend your gaming approximately 12 hours (if not more). In addition, the Switch receives additional support as the kickstand for the SwitchCharge is on both ends of the device, making it that much harder for your Switch to fall over. As an added bonus, on the top of the SwitchCharge, you can store 2 additional games! The SwitchCharge is not expected to ship until August of 2017, then again with Nintendo Switch inventory issues – if you currently don’t have one – you may want to pre-order one now. What do you think about the SwitchCharge? Tweet us @AsianGeekSquad! Check out SwitchCharge on Indiegogo!